Testimonial Richard and Jayne Burkmare, Hill House Milford On Sea. "Forest Trades have recently been involved in the refurbishment of our main bathroom, working alongside MJ Featley plumbing and heating they have gutted out the room built new stud work, built in fixings for the new wet room suite,fitted the hidden shower tray, plyed the floors, plastered decorated and re-hung the door. We have been pleased with everything they have done and will happily recommend them to people. We have spoken about future works and will no doubt see them again soon." 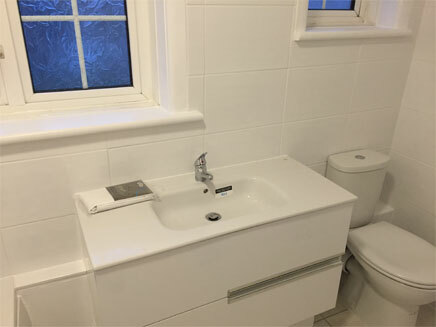 "Dan and Steve came to our aide when a tiller we had booked in to do our bathroom let us down at the last minute, they were busy at the time but kindly came in over a saturday and sunday and got our bathroom tiled for us much to our relief. they have done a wonderful job for us, and will be back at some point to re-plaster our front room. 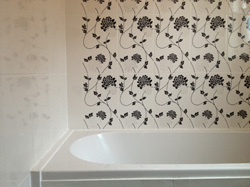 I would defiantly recommend them to anyone looking for a good service from a builder." Testimonial Sheila, Hop Pole Cottage Sway. "I enlisted the services of Dan and Steve after seeing them working on my neighbours property. I had an extension built but still had the landscaping to tackle. They gave me a very competitive quote on the job and swiftly set to work. I am very pleased with the out come, my country cottage is now complete. I have recommended Steve and Dan to other people and have heard they have done good work there as well. " 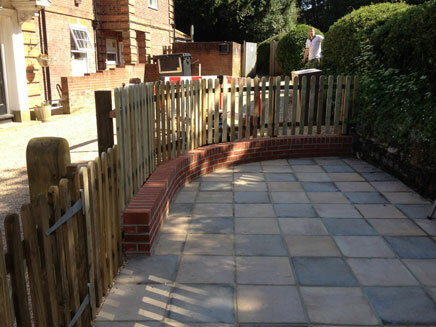 "Steve and Dan came and took care of some landscaping and fencing for me on a refurbishment contract, at a private care home in the New Forest. I had been let down by a previous contractor and i was on a tight deadline for completion. The guys stepped in at short notice, worked very hard and got the project finished with time to spare. I will be having them back to do additional works to my home address in the future and would recommend them to anyone else." Brenda & Roy Evans. Milford on Sea.
" Dan & Steve have just completed the redecoration of the master suite comprising bedroom,dressing room and newly appointed bathroom.We were impressed by their timekeeping,care in ensuring everything was covered up,and workmanship which is to the highest standard.Furthermore their quotation was also competitive.We would be happy to recommend them to our friends, and would use their services again without hesitation." "We have since had Dan and Steve back to do our kitchen and decorate several other rooms." "I first had Dan and Steve working at my property when they worked for another company, Dan was the foreman for my extension and renovation project to my farm house. He designed my extension with a large skylight and hidden gutter system down to the last screw. Drew up the plans, sourced all the materials and additional subcontractors at the best possible prices. He then managed the project and crew day by day doing a lot of the carpentry, plastering and decorating himself and quality checking the work of the subcontractors, leaving little snagging at the end of the project. 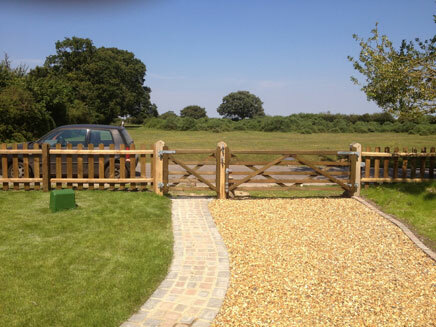 Whilst on this project Dan also designed, sourced out and installed the steel electric gates at the front of my property. As well as working on a lot of my farm house Steve also worked on a previous project through the same firm to renovate and extend an old cob cottage on the same site, doing a lot of the traditional cob repair, lime rendering, ground works and block and steel work for the extension. Since these projects where completed the guys have started their own building firm and i have happily had them back to complete several new projects for me. Initially they landscaped around 800sqm of grounds for me with new trees, large curved and edged beds and 700sqm of turf. They then fitted the new kitchen to my farm house and did some odd carpentry jobs around the place, the finishing touches. After this they referbed a large garage/stable, replacing the roof with a new rubber product. I have been very pleased with everything Steve and Dan have done here, they always have a happy can do attitude and seem to be more than capable of handling any task within the building trade. I have recommended them to friends whom they have completed works for and will be having them back for more projects in the near future."